I won’t say I’ve come around to the city’s vision of the O-Train, but I have to say I understand some of the elements of Phase I better, having seen another city’s light rail system. Recently, my family visited Kitchener-Waterloo. As my wife attended a professional conference, I was able to spend some time in the city, where I lived for a few years. My first impression of that region’s light rail system was that the north-south line was very much incorporated into the Kitchener and Waterloo city streets. I’ve long thought that we could avoid the costly construction of a downtown tunnel here in Ottawa by planning a smart rail corridor on Slater and Albert streets, two major one-way streets that bisect downtown Ottawa from east to west. These streets are cluttered with buses every day. It made sense to me that you could replace those buses with a surface rail line and still be able to retain a thoroughfare for vehicles. Of course, that vision died with former Mayor Larry O’Brien, who began to champion the idea of a tunnel. When I saw the KW tracks running up and down King Street in parts of Kitchener and Waterloo, my first impression was that the region there is heading for massive traffic headaches. In some spots, these light rail tracks make sharp right turns and dominate busy intersections. In other places, drivers will be forced to make right turns off King Street by crossing the tracks, which are tucked away to the right of the street and separated by a small curb. I can foresee trouble with this system, based on my fleeting assessment. It looks much more like a streetcar line than a light rail line. A friend of mine told me that the region has had troubles in recent months with delayed delivery of the Bombardier trainsets. So far, only a handful of trains have been delivered and have been tested on the new KW light rail system. Ottawa, by comparison, looks to be in good shape. The fleet of Alstom light rail trains has largely been delivered and is being tested and readied for next year’s launch of commuter service, whenever that actually happens. Recently, I was able to have a look at the progress of the Confederation Line on its west end. Most of my looks at the new system have been in the east end, particularly around the Via Rail station on Tremblay Road. The eastern half of the system is much further along in its development than the west end, but that is changing. Catenary is going up on the LeBreton Flats. Rails have been laid in recent months. The Pimisi, Bayview and Tunney’s Pasture stations are all starting to take shape, including the roofs, stairs, walkways, platforms and other structural features. I know the Lyon and Parliament stations are also taking shape nicely, although that progress is not being seen, since both stations are underground. I was walking in the area when I caught site of some maintenance of way equipment near Pimisi Station. It’s a good sign that testing might not be far off. The poles are up, the MoW equipment is on the line and progress is being made. Those buildings you see in the distance are Tunney's Pasture, where the Confederation line will end next year. Meanwhile, the Trillium Line continues to operate, as per usual, in the shadow of the Confederation Line hype. I was on the Trillium Line not too long ago and took this shot from the Carling station platform. The city rolled out its Get Ready for Rail ad campaign in recent months to educate riders about how the new transit system is going to work. In many respects, the transit system we have now is a point to point system, but it will change to more of a hub and spoke system when the Confederation Line is operational. The city has even asked residents to submit their ideas for train names, as each train will be named. I was told that “Trainy McTrainface” will not be accepted, but the appeal was made to children in particular, so who knows what direction that naming will take? I wonder if Thomas will make the cut. As you get closer to the western terminus of the Confederation Line at Tunney’s Pasture, you can see the first signs of the catenary poles going up, as most of them have been erected. I am hoping in the coming months that I might be able to catch some images of testing happening on the LeBreton Flats section of the line. Speaking of that end of the line, you can see the recently erected fencing that is preventing people from using the Prince of Wales Bridge as a makeshift pedestrian crossing. There were some fairly significant protests when the city finally came around to the fact that the bridge will be used for light rail, but those efforts did not go far. Common sense prevailed instead. To be honest, I'm surprised it took the city this long to fence off this bridge, given the potential safety issues of people using it as a makeshift pedestrian bridge. I would imagine that longtime residents of the city must be smiling to see the sight of train tracks back on the Lebreton Flats, after nearly 50 years absent. This section of the city has been dormant for so long and is now set to reclaim some of its rail heritage, which will in turn bring so much more life back to this longtime wasteland west of downtown. When you think of the new Senators arena, the new main branch of the public library and other projects taking shape in this area, you begin to understand how the ridership for the O-Train will develop. Just how long was it? 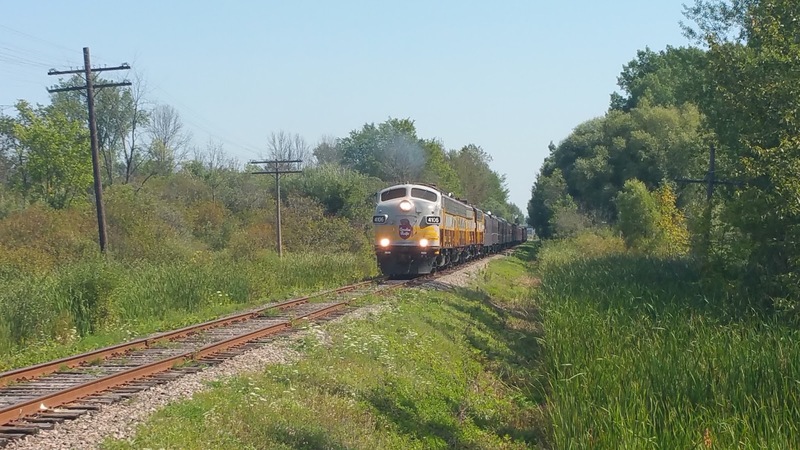 When I was young, one of the great joys I had was to count the cars on a passing freight train, whether it was a mixed freight on the CSX line through Corunna or on a CN freight train in Sarnia or even a CP freight close to my grandparents' house in Windsor. Today, I notice many railfans, particularly those who are fascinated by the technical aspects of railways, will report the approximate length of the train or an axle count. I am not interested in counting cars anymore or counting axles for that matter, but I came across a freight train recently that made me consider just how long freight trains are these days. Before I get into the story, I will point out the obvious. Freight trains have grown longer over the last few decades, with the advancement of distributed power, the use of AC traction and the general progress of motive power compared to the geeps and GE units of yesterday. I remember when I was a kid and saw a train of 100+ cars. I was always impressed with a train that long, but that length is not even noteworthy today on a busy main line. With that in mind, here is my story of a meet with a long freight train on the CN Strathroy Subdivision from this October. I was heading west toward Sarnia for a visit with family for the Thanksgiving weekend when I decided to take a break in Wyoming, after a long day on the road. Up until Wyoming, I hadn't seen anything on the Strathroy Sub from the Confederation Line, which parallels the sub between Strathroy and Sarnia. When I arrived at the Broadway level crossing, I noticed the tail end of a freight train near the Wyoming train station. But, the train wasn't moving. It was stopped. I headed back to the Confederation Line and continued west, to see if I could find the head end. And I did find it. A full concession west of Wyoming. Past Kerrigan Road is Camlachie Road, a north south county road that terminates in the lakeside village of Camlachie, just north of Sarnia's city limits. It was at Camlachie Road that I found the head end of this train. I was intrigued as to why this train was stopped here. The sub is single track until it gets closer to Mandaumin Road, where the main line splits into double track until it connects with CN's Sarnia Yard. I made sure to get as close as I could and take note of the power up front. I was quite glad that I took my time because the power on this train was pretty cool. Here's a shot from the other side, with SD70M-2 8803 in the lead. I find these engines pretty ugly. The front end looks like some hideous compromise between the typical angled wide nose engines of today and the boxier feel of the old geeps. But the lead unit was not really what caught my eye. Do you see which locomotives are second and third in line on this train? CN 2415. A Dash-8 40C cowl unit. But there was more! CN 2434. Another Dash-8 cowl unit. My brother says these units are pretty common on this subdivision, based on his sightings, but for me, it's always a coup to see one. You can also make out the flat car and the carbon black hoppers trailing the power. The last time I saw a cowl unit, it was a safety scheme cowl unit on a westbound mixed freight heading for the tunnel beneath the St. Clair River. You can see that post here. I stuck around for a while to see if the train got going again, but it was definitely idling for some reason, most likely a bottleneck near Sarnia Yard. Either way, it's always a nice break when you can get a shot of a freight train and not have to rush around. But the question in my mind remained: how long was this train? It extended from Camlachie Road all the way to the Wyoming Via Rail station. Well, here's how I arrived at a solution. My first step was to plot a route on Google Maps from a place on the corner of Broadway Street in Wyoming and the intersection of the Confederation Line and Camlachie Road. I did this because I needed a measurement from a road close to the Via station (which has no fixed address and is located off a side street) all the way to Camlachie Road. Since I choose a point on Google Maps that went from intersection to intersection, I found out that the distance was 3.8 kilometres. A long train, right? But we're not done yet. Since the train was basically extended to the Via station, which is not on Broadway, I had to find out the distance between Broadway and London Street, which is close to where the station sits. Technically speaking, the Via station has no address on Google, which made this calculation a little more difficult. Google Maps told me that the distance between Broadway and London streets is 200 metres. So, that means the train was about 3.6 km long, right? Well, not quite. As you might tell from the photos, the train is stopped roughly 30-40 metres from the crossing, so it was probably closer to 3.5 km long. For those who prefer miles, that means this train was about 2.17 miles long, not factoring in slack, which would certainly add some distance if the train was fully extended. So, all in all, it was a pretty typical length for a main line freight train. Whatever the true length was, I thought it was a fun challenge to try and get a measurement on this train, particularly without the help of mileposts. For someone who loathed math in school, I'm happy I paid attention. When this year started, I was looking forward to the numerous festivities that coincided with Canada’s 150th birthday. I have to say in all honesty that this year hasn’t quite lived up to my expectations. For one, the weather in this part of the country has been pretty awful. The weather on Canada Day in Ottawa was the worst I can remember (and this coming from someone who once walked home from the fireworks show in the evening in shorts when the temperature was 9C). So what went wrong exactly? Well, aside from the weather, I think that the year just didn’t live up to the hype. A number of official events were organized around Ottawa and were well received, but I didn’t get the sense that people were in the mood for much celebrating. I could be wrong, but I just didn’t feel much excitement. There were some great moments this year, to be fair. And I will start with the railways. First off, Via Rail made railfanning fun again with their massive wrap effort. I have not had this much fun shooting Via Rail corridor consists in ages. Make railfanning fun again! Westbound Via corridor train through Kingston in May with two sharp Canada 150 wraps. Photo courtesy of my wife, who was taking shots from the passenger seat of our car on Highway 401. Both the Canadian National and Canadian Pacific rostered specials for Canada’s 150th, but I didn’t get to see either one of them. The CN special arrived in Ottawa in May on a horribly grey, drizzly day. The train was chartered by the Big City Mayors Caucus, which is a group that falls under the Federation of Canadian Municipalities lobby group. The CN train included a few green and gold business coaches, but the train pretty much came and went unnoticed. There was no media coverage of the train. The only real attention it garnered was from local railfans who braved the elements and got some shots of this ghost train through the mist. The only reason I knew it was coming was because there was an advertisement in the newspaper that someone at work handed to me, as an example of a type of advertisement I would be working on for a marketing campaign. This video is from Ottawa railfan Blake Trafford's channel on YouTube. If you haven't checked him out, go see his work on YouTube. The Canadian Pacific’s 150 train was a much bigger effort and created quite a splash when it arrived in Ottawa. However, I read a fair number of comments in social media from people who were disappointed by the event at the Ottawa train station on Tremblay Road. Many suggested the event wasn’t terribly well organized. From the photos I saw, the train looked great. Many of the coaches I saw on last year’s Holiday Train were in the 150 consist. An example of the type of coaches that were part of the Canada 150 train this summer. This is a shot from last year's Canadian Pacific Holiday Train in Finch, Ont. I was, sadly, out of town when the CP train made its way to Ottawa in a roundabout way (from Montreal to Smith Falls on the Winchester Sub and into Ottawa on Via Rail’s Smith Falls Sub). The trade-off wasn’t so bad, though, since I did more railfanning in London than I have in years. Five posts of London material later, I still have more photos to share, but they will have to wait for a while. Even the week following the CP 150 train's arrival in Ottawa, a few of my fellow railfans told me that CP was keeping its train in Walkley Yard and urged me to go and get some shots, but I was working that week and had no opportunity to get out there. The train was, understandably, heavily guarded anyway. Lucky, local railfan Keith B. graciously shared a photo from his meet with the train before it left the city on Aug. 29, which I have been saving for this post. CP's 150 special heading out of Ottawa on the Beachburg Sub. What I love about this photo is it could have been taken in the 1960s. Timeless. By the way, Keith is active on Pinterest. Do yourself a favour and spend some time there. There are great Ottawa railfanning photos there. The other major disappointment for me is that my Canada 150 history posts have taken far more time than I had ever thought they would, so many of them will not see the light of day for a while. I did manage to finish several of them this year, but I had originally envisioned to do 10 posts or more. In case anyone was wondering about this series of posts, they will become part of an ongoing series that will continue indefinitely. As always, if there is anything you want to see me look into, just leave a message on this post and I will add it to the list. On a personal note, I was disappointed with the fact that life has become busy for me this year to the point where my blog has taken a back seat to more pressing matters. I’m sure some people have noticed some longer gaps between posts. I’m grateful no one has called me out on this. As I mentioned when I started this blog, my aim was to post material each week and I have tried to maintain that pace. I have found that pace hard to keep at times this year, mostly because of the pace of my own life and the utter dearth of railfanning that I often encounter in Ottawa. I have made the most of trips out of the city but I am aware that many people want to hear and read about Ottawa area railways. In the coming weeks and months, I am going to try to get out and take some shots around Ottawa. I have learned, through maintaining this blog, to avoid making promises. I hope that the blog has remained relevant and engaging this year and will continue to serve as a forum and spot for local railfans and the many other scattered around Canada and elsewhere. I will continue to try and keep the Beachburg Sub moving, but I’m hoping for your continued patience in the comings weeks and months. The Arnprior Turn has been a mixed blessing for this blog. On one hand, it really has generated a lot of enthusiasm among local railfans. It has also spawned a lot of discussion on this blog. On the other hand, it has at times overshadowed everything else that I wanted to share. Don't get me wrong, I'm not complaining. I'm just trying to describe my ambivalence toward this one lonely train. And, let's not forget that CN also operates 589 on the Smiths Falls Sub twice a week, for the most part, where customers like SynAgri and Kott Lumber require fairly regular drop-offs and pick-ups, depending on the time of year. All this to say, there is more to railfanning in this city than the Arnprior Turn. However, I have pursued this train for several years and have caught it a select few times. The trick to catching this train is figuring out how much work CN crews need to do in Walkley Yard before they set off for Arnprior. But I have caught the train a few times and wanted to present a small photo album of my favourite shots from my meets. In April 2015, I nearly caught the Arnprior Turn on its return to Walkley Yard. I say almost because I was a little late and watched the train pass over the Moodie Drive flyover as I waited at a traffic light. I was just on my way to a spot to photograph this train when it passed by me. This was the only really decent shot I got while waiting at the traffic light. It was the first of many frustrating experiences with this train. A month later, I had a morning to myself so I set off for a spot on the Trans-Canada Trail near Corkstown Road to catch this train. I had heard that it was passing through at a certain time. The tip turned out to be a good one, as I didn't have to wait long to catch it. This was one of the few times when I was able to catch the train at this spot. Its timetable often fluctuates, which means it will leave you waiting. And waiting. I didn't have to wait too long to catch this train a third time. In September 2015, I was on parental leave and would sometimes take my baby daughter on a short drive before I picked up my oldest daughter from daycare. I often took a different route to the babysitter's house so I could pass by the Beachburg Subdivision's Corkstown Road level crossing. This was the result as a two-car consist was making its way back to Walkley Yard. It took a lot of photoshopping to touch up this shot, which was taken in some harsh sunlight from a parking lot near the crossing. I mentioned that this train was a frustrating one to catch, right? In June 2016, I was taking photos near Fallowfield Station when I decided to head back to Bells Corners to set up for a meet with this train. As you see, I was just seconds late. Here you can see the train crossing Highway 416. In February of 2016, I was on my way home from an early morning appointment when I was travelling on Northside Road, which parallels the Beachburg Sub. I nearly missed the train, but as it passed, I managed to pull over and get a few shots. I can't tell you how many times I have had near misses with this train. Thankfully, this hasty meet turned out okay. I got quite a few shots from this meet, but I liked this one. As I mentioned before, the changes in this train's timing often meant I have been left waiting at this spot only to realize I was not going to catch 589. Since I have been back working in downtown Ottawa , I have not been able to even think of chasing this train. My last meeting with this train was again on the Trans-Canada Trail near Corkstown Road in April of this year on a day off. I really liked this shot because it captures a vintage GP9 in the old safety scheme pulling a four-car consist. This is the longest Arnprior Turn consist I have seen. The crew even gave me a wave. I would imagine they have a good laugh at the few foamers who bother to try and catch this train.